Designed by farmers for farmers, AgCinect is a farm and ranch management and data solution making its debut at the North Dakota State Fair. CEO Jon Richter said the Linton-based company is just releasing its product to the public after three years of organization and development. “About three years ago we had a group of farmers and ranchers come together and wanted a better way to manage their data, manage their profitability, and manage the inputs that they put in their systems,” he said. There particularly was interest from partnership farms, in which multiple family members had hands in the operation and needed to share data. “There was another product out there that did some of these things. It was very costly,” Richter said. So the group of ag producers began working with Plains Mobile, which provided the platform for building the business solutions. They tested the solutions in their own operations, creating and refining the features they needed. “The way we basically continue to evolve is based on feedback of our partners and customers,” Richter said. New features are added on an ongoing basis. Because the solution is cloud-based, customers don’t have to concern themselves with updates. There’s no downloaded software but users simply log into their online account from any device in any location. Accounts can be set up with multiple user access for partnership operations. – calving calendar for records of breeding and birthing. – feedlot management to track inputs and doctoring. – livestock management for maintaining genetic information and automating feeding cost records and tracking inputs by pen or group. – field tracking to keep historical data on crop rotation and seed varieties. – seed-to-sale allows oversight of field inputs from seeding to harvest, along with analytics of expenses and results. – equipment monitoring to track by hours and repairs to see the overhead costs and incomes associated with specific equipment. – inventory management helps oversee quantities of grain, chemical and livestock. This helps gain insight into commodities available for future planning and smarter purchasing. – accounting keeps track of sales and receipts while generating balance sheets, income statements and other financial reports. The company’s consultants assist customers in getting setup. 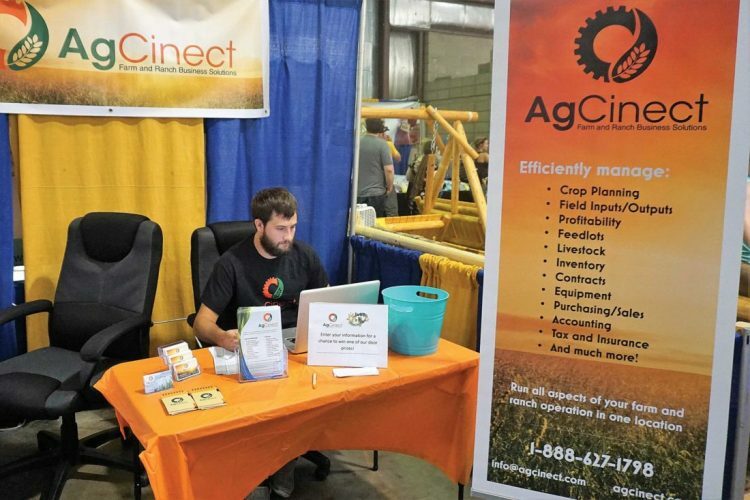 During the State Fair, AgCinect is offering introductory pricing that makes it worthwhile to stop by the booth in the Commercial II building on the northeast corner of the fairgrounds. The company also has offices in Linton and Bismarck and can be found online at agcinect.com. Manning the AgCinect booth at the fair this week, employee Cody Hickel said interest by fairgoers has been greater than expected. Many farmers say they use computer software programs but aren’t necessarily aware there is an option out there that can give them much more detail, analytics and data, he said.